Dacia Ireland recently introduced the new Duster Phase 2, with changes to both the exterior and interior and enhancements to the range and product offering. A new trim level, called ‘Prestige’, has also been added to the Duster range, following on from what it says was the popularity of the ‘Signature Prime’ limited edition that was launched last year. Dacia says that Duster Phase 2 gets a new refreshed look inside and out, but still keeps its comparatively very affordable price position with an increase of just €300. Some of the main changes to the standard equipment include DAB radio, making the new Duster the first car in the Dacia range to feature factory-fit DAB. 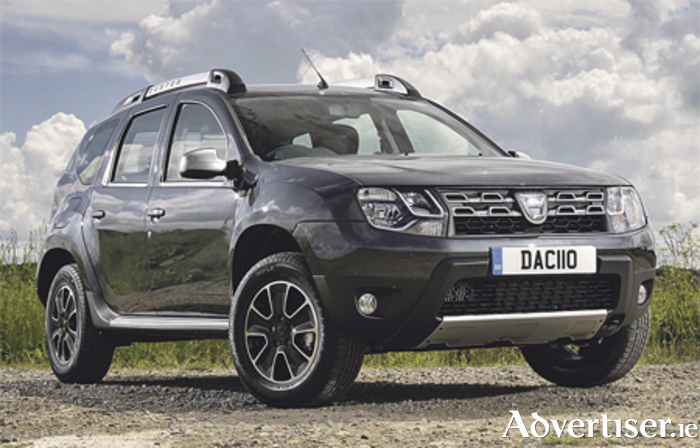 Dacia say that the new headlights on the Duster are a great improvement, with a more modern styling complementing the chrome grille. There are changes to the interior trim, with both the Duster Alternative and Signature receiving new seat upholstery which gives the seats a more sculptured appearance. The Duster also gets a new more stylish dashboard. Most notably, the central section of the dashboard changes from light grey to dark carbon finish. There is also a new satin chrome centre console surround and the lower steering wheel insert changes from piano black to satin chrome finish, improving the perceived quality in the cabin. Dacia Ireland says that for their customers who like to stand out from the crowd there is a new metallic paint altai green body colour available for the new Duster. New high trim level Prestige will be available in both 4x2 and 4x4 and will be available for just €1,200 more than Signature versions. It offers buyers the chance to own a more distinctive, more personalised car while remaining faithful to Dacia’s affordable’ value-for-money ethos. In addition to the Signature trim, Prestige will feature: 16-inch Tyrol diamond-cut alloy wheels which add a touch of class; MediaNav Evolution multimedia system; and rear parking camera, which includes parking sensors. The MediaNav Evolution has been re-designed with a full-colour menu screen and is now compatible with Apple’s SIRI voice recognition function and TMC live traffic information. There have been hardware improvements and the system allows access to the AHA cloud platform via a free smartphone app. Through the seven-inch multi-media touch-screen users have access to navigation, infotainment, and hands-free telephone services. They can stream music via Bluetooth or a USB or AUX connection and can connect to social networks via a smartphone. Later this year, the new Duster will be getting an EDC gearbox which will be available on dCi 110 4x2 versions. Pricing will be announced in late 2016. Dacia continues to be the smart purchase for Irish drivers, with almost 11,000 Dacia cars on the road here since the brand’s launch just four years ago.